'Mann ki Baat' a special radio programs where Mr. Narendra Modi and Mr. Barack Obama would share their thoughts and respond to questions was announced by Mr. Modi himself via Twitter on Thursday morning. U. S. President Mr. Barack Obama joined Prime Minister Narendra Modi in his monthly radio interaction Mann Ki Baat on All India Radio on January 27, 2015. 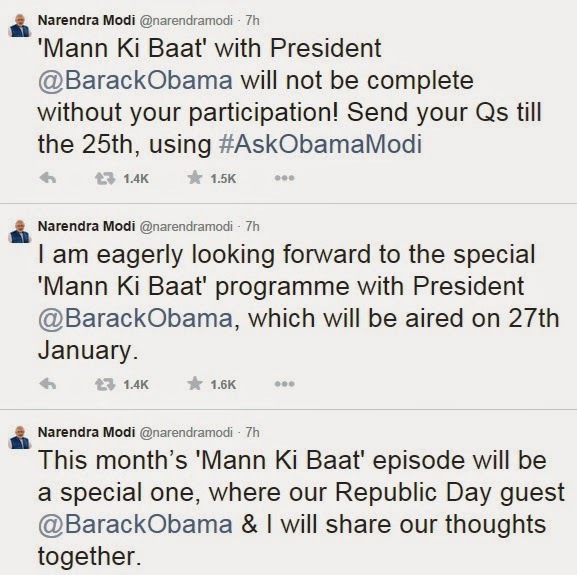 Mr. Modi tweets that " 'Mann Ki Baat' with President @BarackObama will not be complete without your participation! Send your Qs till the 25th, using #AskObamaModi "
For more latest updates of Radio and Television channels of DD Freedish, keep visit www.freedish.in blog.